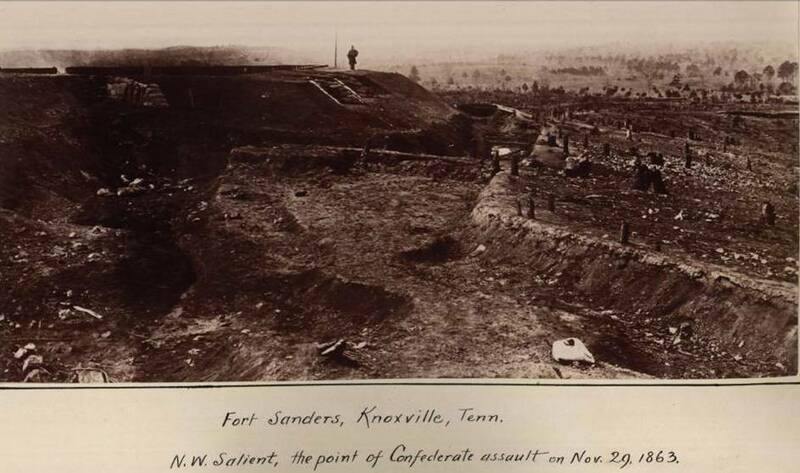 Below are images of a re-dedication ceremony honoring two 100th Pennsylvania soldiers that died during the Battle at Fort Sanders (also called Fort Saunders), Tennessee, November 29, 1863 at the tail end of the Siege of Knoxville. The two soldiers were Isaac R. W. Garretson and Aaron Templeton of Company A. The re-dedication took place in the National Cemetery at Knoxville, TN around the time of the unveiling of the stone shown as May 29, 1891. 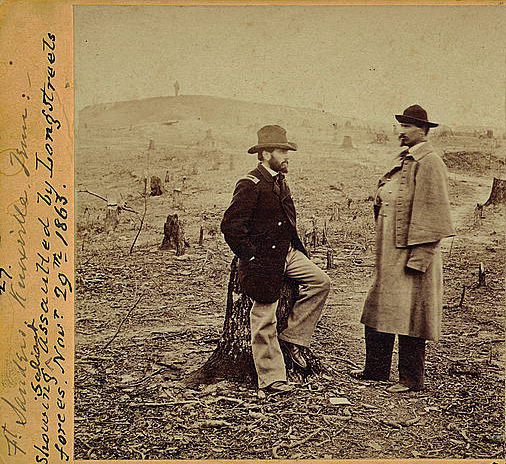 In the photograph, George B. Forsyth, of Co. B is present to the immediate right of the stone. Pvt. Forsyth belonged to the Capt. Thomas Espy GAR Post #153, of Carnegie, Pittsburgh, Pennsylvania. The memorial is located in Plot B-900, Row 12. Garretson, about 22 years old at death, is apparently buried here while Templeton's body was reburied in Washington Co. Pennsylvania, his home. Templeton was killed at about 25 years of age. 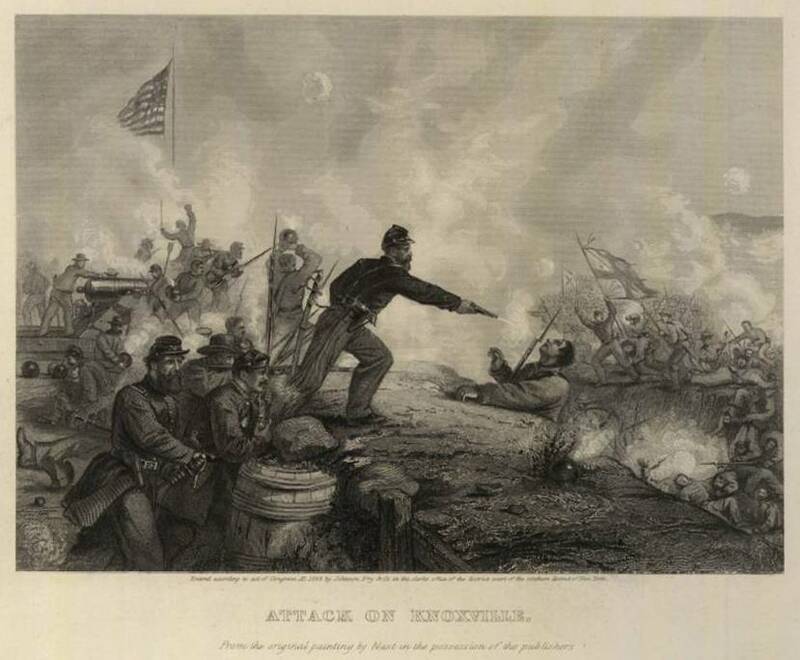 In addition, I have posted some images or links pertaining to the November 29, 1863 Battle of Fort Sanders, a US tactical victory that capped the Siege on Knoxville. 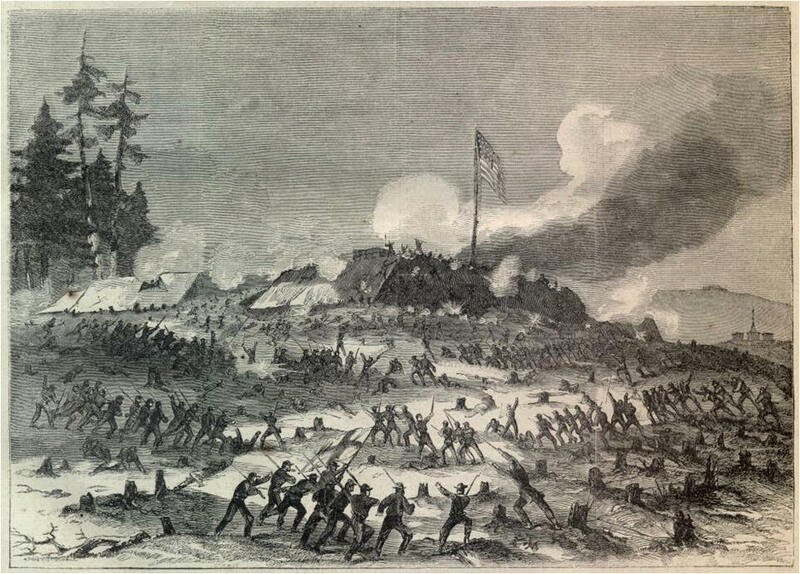 The battle was over very quickly, approximately 20 minutes, as the Confederate engineers and command had not forseen the large ditch that spanned the front of the fort walls, creating a virtually impenetrable barrier. Union forces inside, including the Roundheads fired onto the assaulting Confederates of General Longstreet's corps with artillery shell, canister and rifle fire. There were approximately 900 Confederate casualties and 100 Union casualties that resulted following the failed assault. George B. Forsyth, Co. B honoring his fallen comrades Templeton and Garretson of Co. A. Top of Monument with US flag over stacked arms inscribed, "Two brave and gallant defenders of the old flag"
Note: Read newspaper article left to right by column, with four columns. Slide 4 is columns 2 and 3 only. This news article gives some detailed information regarding the part of the 100th PA in this battle. Company A was the only company from the 100th PA that was engaged. Based on an eyewitness account by John B. Kennedy of Co. A discussed in the news article, Pvts. Garrentson and Templeton were killed in an area of the fort that did not have constructed cotton bales on the outer edge of the parapet wall for protection; instead there were branches of trees that were placed as makeshift protection. These branches did not provide adequate cover compared to the cotton bales. These two soldiers were two of eight (8) total union soldiers within the fort confines that were killed. 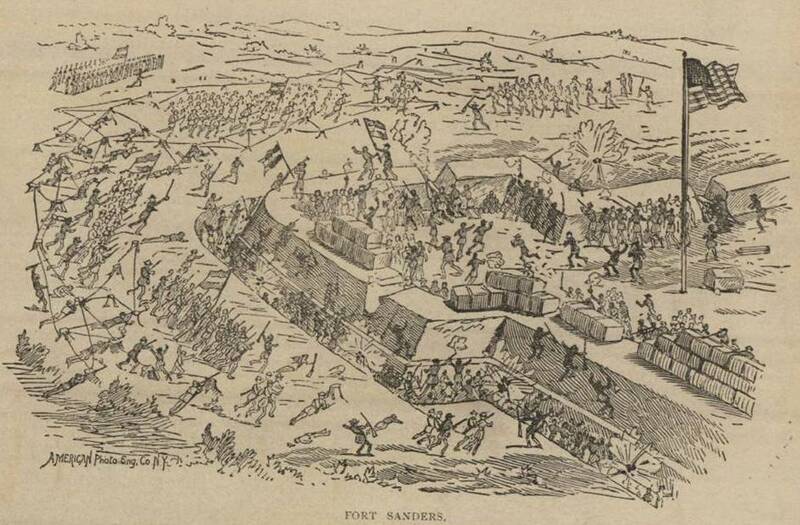 Another 30 were killed outside the fort confines. On the Confederate side, 129 were killed, 448 wounded and 226 missing, all attacking under command of General Longstreet. 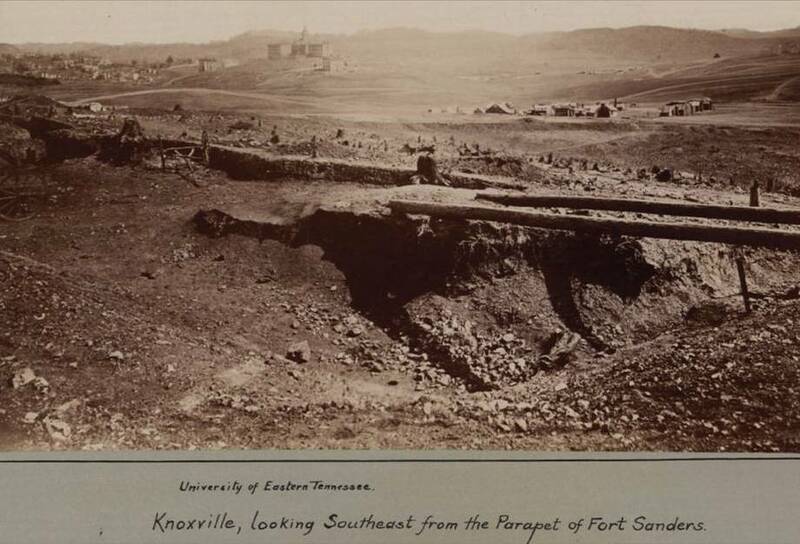 Most were killed within a deep trench that was dug by US Engineers on three sides of the fort. US Engineers took telegraph wire and tied the wire between the stumps in background to help trip up the Confederate assault on the salient in the background. After they were slowed down by the wire, they encountered a deep ditch in front of the bastion walls. www.battleoffortsanders.com photoThis photo gives a good sense of the size of the ditch in front of the bastions that the attacking Confederates confronted. Note telegraph wire strong between stumps to slow assault and cotton bales piled at the top of parapet walls. Co A was inside the fort during the assault. Note logs across ditch fronting bastions to get a sense of what the attacking Confederates had to cross. Also, several broken caissons are visible inside the fort confines. Note stumps in front of ditch and bastion walls where telegraph wire was strung between to slow the attacking enemy. Note stumps in front of ditch and bastion walls where telegraph wire was strung between to slow the attacking enemy. The similar Library of Congress photograph (r) looks to be taken same day with two officers standing in opposite places. 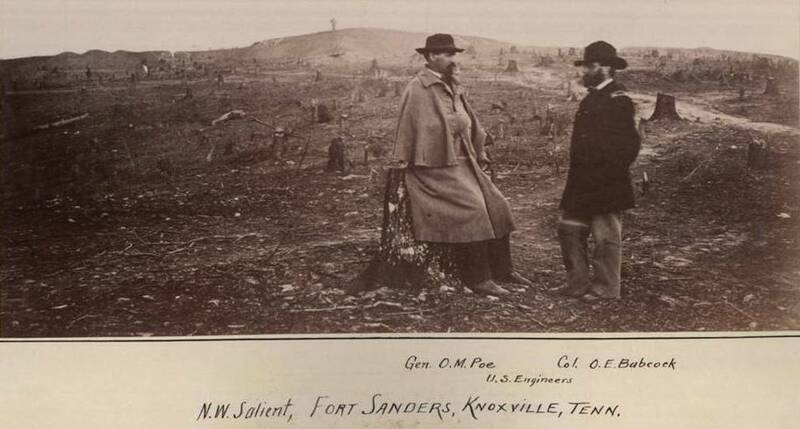 Right Photo showing Fort Sanders (l) with ditch and stump field in background. 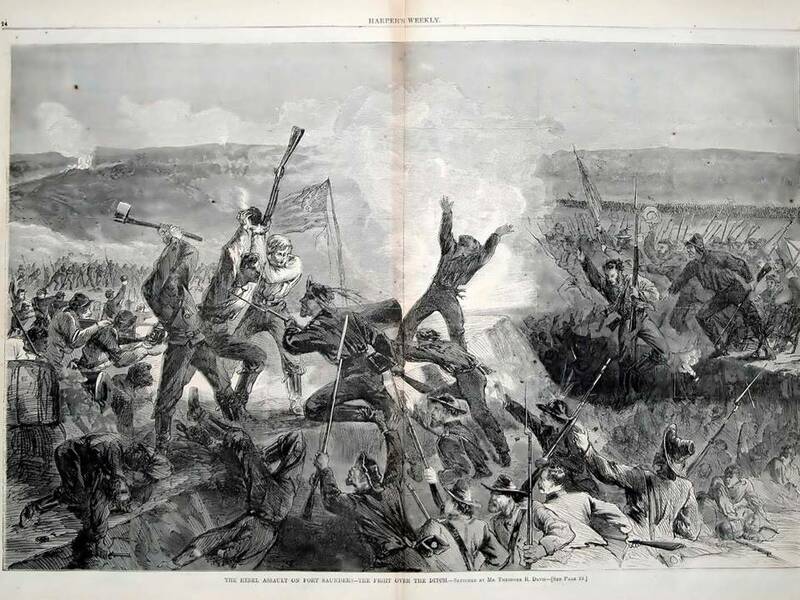 Lithograph of Battle at Fort Sanders, though it states Siege of Knoxville--the overall campaign, Johnson, Frye and Company, New York, 1868, after the original painting by Nast. Memorial Re-dedication of Pvts. Isaac R.W. 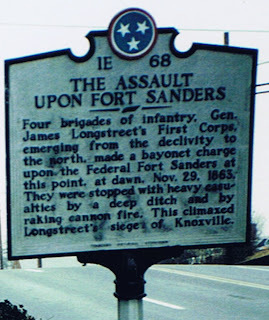 Garretson and Aaron Templeton, Company A, killed at Fort Sanders, TN, November 29, 1863 and other information pertaining to the climactic battle completing the Siege of Knoxville.